Control Universal Pro, Motorized MIDI Control Surface from Mackie in the MCU series. The Mackie Control Universal Pro gives you smooth fader control with the responsive feel of some very expensive analog boards from years past. The faders are touch sensitive 100mm, and they are motorized. There is a full meter display that will show you the parameters and track names. There are some effects on this unit but nothing that really made me say “wow”. All of your basic functions are also there and easy to use like pan, solo, and mute functions. 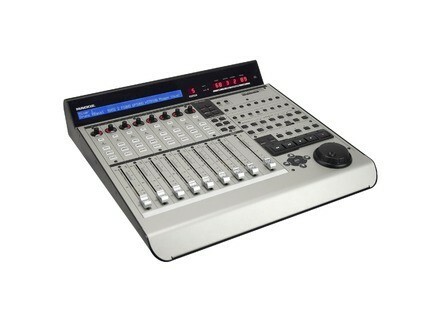 When you get the Mackie Pro I recommend looking at the manual even if you have used similar boards before, or even if you have used the Mackie C4 because some of the functions are different and this unit has some more features that are really helpful. This console is made well, all of the knobs are solid and the faders are “heavy” with good response. This control surface has over 50 buttons and can even be used via USB. The price point is decent, I think it could be a little cheaper though because there are some other boards made by its competitors that cost a little less but are virtually the exact same board. Also the display screen could be just a little bit bigger on it so that it is easier to read or maybe even a full color display since this unit cost over a grand. But if you do not mind looking at this type of display then it will not be an issue. Or you could always hook up an external display screen and have any size screen that you want. 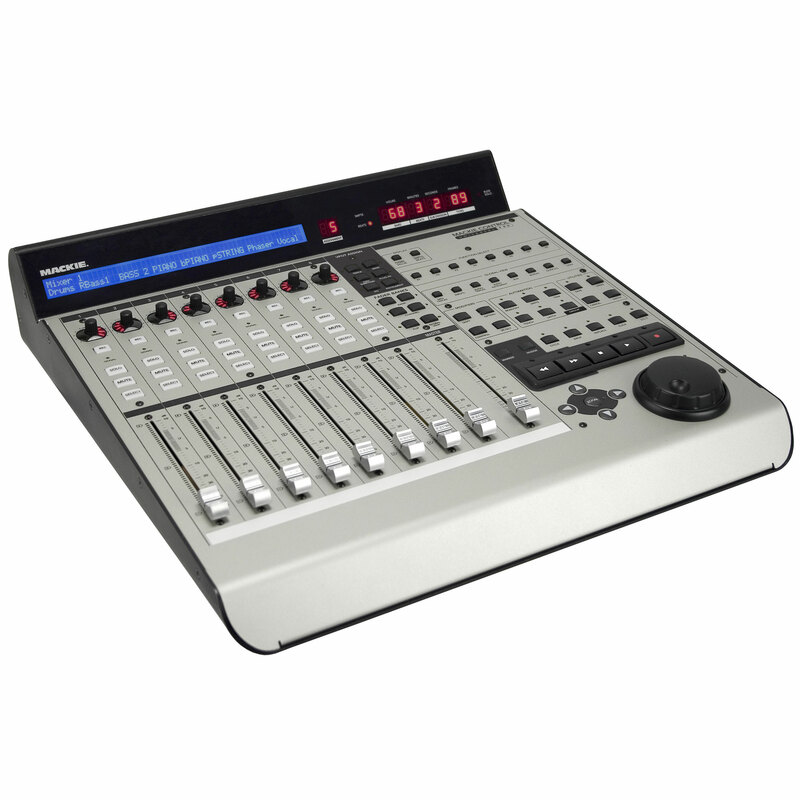 The Mackie Control Pro is a great choice to go with because of the quality and features that it provides. Mackie will also provide you with excellent customer service if you have any troubles with this device. I am happy that I purchased this! I have been using this control surface for a few months now, after upgrading from the original mackie control universal. This one is awesome! To be perfectly honest, this newer version doesn't bring that much for features to the table. One of the most notable is the fact that connectivity is now a lot easier. With this version, you can connect the mackie control universal plus three other expansion items, whether the extender pro or the plug-in controller C4, all with a single USB connection. You only have to connect the expanders to the main MCU unit with MIDI, and then the MCU can hook up to your computer via USB. This makes for a lot less cabling and mess on your desk. The look and feel of the unit is definitely a lot more sleek and professional now, and the LCD screen displays have been imrpoved. They are now easier to read and are angled so the whole set up is a lot more ergonomic. A nice thing about this control surface is that it is basically customizable to all major host platforms. The faders and panpots are obviously all going to work with any software, but the host specific interface and transport buttons can be programmed to work according to your specific host. Mackie even includes plastic overlay sheets that label the buttons properly for your given host. The faders on this unit are very sensitive in a good way, and are thankfully pretty quiet which reduces distraction when you have automated faders and you are trying to mix. Overall, this control surface is a great fit for me, and allows you to finally have some tactile control over your software in a way that makes sense. This unit is pricey still because it is relatively new, but get yourself one of these and a few extenders and you won't regret it. Best control surface on the market right now. Super controller used with Cubase 4 on Mac and PC with Nuendo 2. Installation in 2 minutes if you take the time to read the manual that came with it. A little expensive when even if it achte nine, found in a secondhand shop. Aspect super durable finish top, nothing wrong level. Not had time yet to work assignments of buttons but looks pretty easy with Nuendo. used in post-production studio video for 9 months, and completed two of its extensions, I find this very disappointing MCUpro! First, the faders are terribly noisy (the calibration sequence at startup is scary)! Then, after three months, a power supply broke down (connected to UPS / RFI)! Then last month, after only eight months of almost daily use (8 hours per day on average), the MIDI block is broken down, making the delirious MCUpro and two extensions, and making everything perfectly useless ! Fortunately repaired by Mackie (in China, where I live) in 4 days! The jog wheel, in turn, is rather imprecise for my taste, with jumps of Frame and involuntary step backwards rather annoying! The composer I work with uses the old MCU for about 3 years and never had any trouble with (and the faders are much less noisy)! I do not do it again this election, although in this price range, it remains without major competitors! Two faders down the last two weeks, each for the same reason: to drive over the fader out of its guides and badly tangled (and this during the calibration sequence fader start) too difficult for me to repair without tools adapted. I do not use it yet very few of the faders, almost never actually ... I am extremely careful with the equipment I use and the machine does not move the workstation that was designed for her. I use it for some time, just the opportunity to mix a rap mixtape, and some disparate projects. They are very convenient to use, simple and effective, adaptable to a manip largest soft drinks market. I only regret that in ProTools HUI mode the master fader is completely unusable, which makes sense but still pretty average! I tried a few models before this one, the comparison would be difficult, but it is a controller, both beautiful and strong, that makes you want to ask it. Obviously the ratio / quality are not there for nothing! At that price, although it is not given, it is a real investment, has both the comfort, but also deepening its work habits. Without regret, I kept the risk of a very long time ... Until I make a ICON-like in my garage.